British actress Vivien Leigh is best remembered for her part as Scarlett O’Hara, the beautiful Southern belle who will stop at nothing to get what she wants. Her inspired performance won an Academy Award for Best Actress. However, when word got out that she was being considered for the role, letters against the selection poured into Gone With The Wind producer David O. Selznick’s office. The president of a chapter of the United Daughters of the Confederacy wrote a letter stating that she and the members “vigorously protest against any other than a native born southern woman playing the part of Scarlett O’Hara in Gone With The Wind. Furthermore, we resolve to withhold our patronage if otherwise cast.” The Hollywood Reporter’s Joe Shay wrote to Selznick calling it “an unfortunate selection” should someone other than a Southerner be cast. 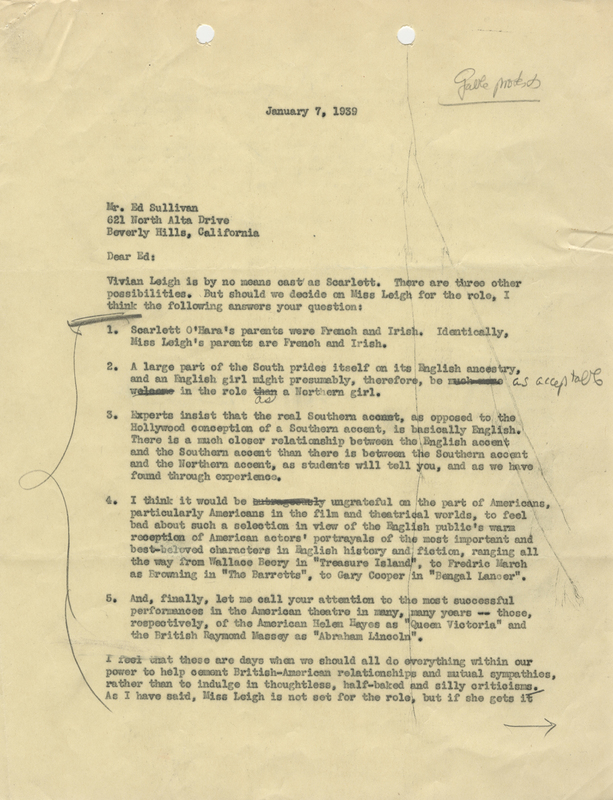 Selznick wrote a letter to Ed Sullivan, an entertainment columnist at the time, defending Leigh. He notes that Leigh’s parents are French and Irish, just like Scarlett’s, and he draws comparisons between England and the South. Selznick writes, “A large part of the South prides itself on its English ancestry, and an English girl might presumably, therefore, be as acceptable in the role as a Northern girl.” Furthermore, he notes the relationship between the Southern and British accents is much closer than that of the Southern and Northern accents. He also points out that the English have warmly received the portrayals of Englishmen by Americans, so Americans would be ungrateful to do the same. Finally, Selznick points toward successful cross-cultural performances in American theater, like the British actor Raymond Massey as Abraham Lincoln and the American actress Helen Hayes as Queen Victoria. The memo is on view through January 4 in the Ransom Center’s current exhibition The Making of Gone With The Wind. A fully illustrated exhibition catalog of the same title will be co-published by the Harry Ransom Center and University of Texas Press in September with a foreword written by Turner Classic Movies (TCM) host and film historian Robert Osborne. Image: Ed Sullivan, then a gossip columnist, had learned that Vivien Leigh was Selznick’s choice for the role of Scarlett. Selznick denied it but, anticipating resistance to his decision, had already developed a five-point justification, which he began to circulate to entertainment reporters. Hi, I am writing a research paper on the UDC, and was wondering where you got the quote from the UDC (“vigorously protest against any other than a native born southern woman playing the part of Scarlett O’Hara in Gone With The Wind. Furthermore, we resolve to withhold our patronage if otherwise cast.”) from.